While working at home… I have two desktops and one laptop. All emails and PDA synchronization runs on the laptop. That way if I need to be on the go, all planning and client correspondence comes with me. One PC is mainly for work, and the other PC runs all sorts of stuff like TV, radio, CDs, music, and other entertainment while I work. But with the tables I got, and how they are arranges, sometimes even just opening the other PC makes me lazy since I have work to do on the work PC. So the PC that serves as my TV is just there doing nothing. My laptop… all my emails are there… I sometimes find it inconvenient twisting my body all the time since the laptop is on my left. And with my table… my legs go all the way in and my legs cannot move freely to turn to the left. All these extra efforts I believe affects my productivity and health as well putting my body in various contortions just to reach stuff. Now I have seen all these nice corner desk at various office furniture websites. But all of them will still require me to spend some money. So I decided why not still give it a try with whatever I have and try to make it work. So I started rearranging things and the two most time consuming parts in doing this is the bunch of wires which I often call spagetti. I still don’t find it convenient facing my laptop at where it currently is. I rather slip out of the table to free my legs and face the left completely. But then I will need a new table. So I still spent some money… I bought a Tabletote. The Tabletote is a product of Instand, manufacturer or portable laptop tables. 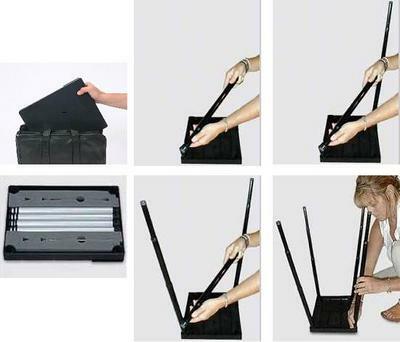 This product could be taken apart and easily fit a good laptop bag. 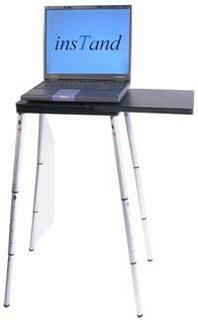 So aside from having a new table, if ever I will be on the go with my laptop, I will bring the table along as well. Although my Tabletote has not arrived yet, and I chose the longest shipping period since that is the cheapest shipping rate, this is the result of my current setup. Wow!! yo amo los cuartos asi! saludos.